We left Olathe, KS at nine and arrived in Council Grove, KS at 11:30am. Just take US Highway 56 all the way. The scenery good and varied, rural, farming and the east side of the Flint Hills (just enough). Several small old towns along the way. My wife and I really enjoyed the trip! Two lane mostly 55 mph. Very little traffic. No potholes. The road is good (though not a lot of twisties). 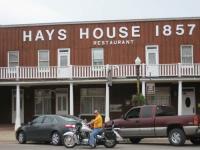 This is a 112 mile ride from Olathe, KS to the Hayes House Restaurant in Council Grove, KS. Council Grove is a good destination, bikers welcome. The Hays House was a great destination with really good Fried Chicken. Along the way you'll pass through several old time struggling towns and a Casey's in every one of them. on October 29, 2010 0 out of 0 members found this review useful. on October 18, 2010 0 out of 0 members found this review useful. really great surface on roadway but no character. If you want nothing but straightaway...this is the ride. Very few curves..Council Groves quaint historical town and a must eat at the Hays House. on October 13, 2008 0 out of 0 members found this review useful. We love the Hays House and ride is great from any direction.